The meeting was called to order by Deanery co-convener Richard Smith of St. George’s, Salinas. Morning Prayer was led by the Rev. Lawrence Robles from St. George’s. Treasurer – No changes were reported since the last meeting. However, we were reminded again that there is a $75 assessment due from each parish. It was suggested that the deanery establish budget priorities which will help parishes understand what their assessment is going toward. Standing Committee – The report from the Standing Committee is that they recently met with the Commission on Ministry to clarify roles; and overall things are going smoothly in the diocese. Ministries to Veterans – Charles Greenleaf, St. John’s, Aptos, reported on a new ministry taking shape at St. John’s focused on veterans. Two Vietnam vets at St. John’s succeeded in getting a grant that has allowed them to open an office providing support for Vietnam and Iraq war vets. They urged other parishes with similar interests to contact them. 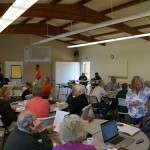 Deanery Website – Jeff Diehl gave a presentation on the new Monterey Deanery website (http://montereydeanery.org/) which was enthusiastically received by the delegates and resoundingly approved. We are all urged to submit events and other news via the easy-to-use tool on the website. Jeff Diehl will continue as moderator for the time being. We are welcome to publicize the web address and acquaint our parishes with its availability. Next steps include notifying the diocese, linking from the diocesan website, and announcing on Facebook. Mission at St. James, Monterey – The Rev. Jeff Kohn gave an overview of St. James’, Monterey, the first Protestant church on the Monterey Peninsula, founded in 1876. He describes St. James’ as a spiritually-centered place. They recognize that they are a small parish, but they have a large building (McGowan House) which has become a spiritual center for Monterey, hosting 27 twelve-step programs, a Korean church, a Zen Buddhist meditation service, and various arts programs. He says they have seen the evangelical benefits of their hosting such services and programs and have learned to celebrate what they have. missio:Engage! at St. John’s, Aptos – Jon Showalter and the Rev. Rob Neville reported on the missio:Engage! program at St. John’s, a two-year redevelopment process sponsored by the Episcopal Church and supported by a community of practice of other churches (see http://5marks.org/). The program costs $5,000 and includes regular online meetings with other churches participating in the program. 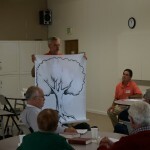 It allows congregations to identify the best way to engage with the larger community and to bring in new members. St. John’s has completed an inventory of their gifts and they are now in the process of developing their skills in welcoming and inviting new members. On June 30, they will conduct a 2-hour workshop on welcoming and inviting and it is open to all churches in the deanery. More Effective Networking – Steve Dodds, St. Philip’s, Scotts Valley, gave a presentation on how we as a deanery can network more effectively, but he acknowledges that the points he makes can be used in any organization. He is the Executive Director of Every Voice Engaged (http://everyvoiceengaged.org/), a nonprofit focused on helping citizens, government agencies, and nonprofit organizations collaborate successfully on improving quality of life. Their process includes various “innovation games” which encourage people to talk together and prioritize solutions. He suggested that the deanery use the process to a) develop a strategy for prioritizing deanery budget and programs and b) get to know each other better. This type of networking process would also work well in developing a capital campaign for a church. Among the announcements of various activities at the churches in the deanery, Maurice Dyer from St. James, Monterey, introduced himself as a new member of the Episcopal Young Adult Service Corps. He will be leaving for South Africa this summer to begin work at the Holy Cross Monastery and School in Grahamstown, South Africa. Prayers are encouraged, along with donations to the diocese to support his work. Follow what’s happening with him on his blog http://mauricedyer.blogspot.com/. Deanery delegates gather before the start of the meeting. Steve Dodds demonstrates one of the tools that could be used by the deanery for effective networking. The Rev. 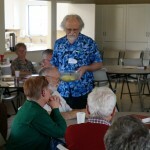 Blaine Hammond invites deanery delegates to choose congregational prayer partners out of a bowl. 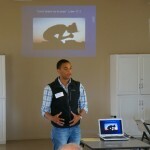 Maurice Dyer describes his plans to serve in the Episcopal Young Adult Service Corps in South Africa.